There is a plant in our garden that I love even more than the abundant Passiflora edulis and that is the more gloriously abundant Cyphomandra betacea, more commonly known as the tree tomato or tamarillo. I have wanted to grow tree tomatoes for many years – ever since my sister-in-law gave me a small jar of tree tomato jam. I thought it so delicious that I have been looking out for a plant at every nursery that I go to. So when I saw three plants at our local nursery I snapped them all up and planted all three in a cluster in what was supposed to be a strictly indigenous part of the garden. Well, I have now modified the rules for this part of the garden and it is allowed to include plants that are not indigenous as long as they can be used in cooking and don’t need any cosseting. I adore this wonderful plant that has been producing fruit unabatedly for about two years now. Even in the depths of the harsh Highveld winter we have regularly harvested fruits and sliced them into salads. Tree tomatoes are native to the Andes and although not wildly common in South Africa they seem to be very popular in Australia and New Zealand. 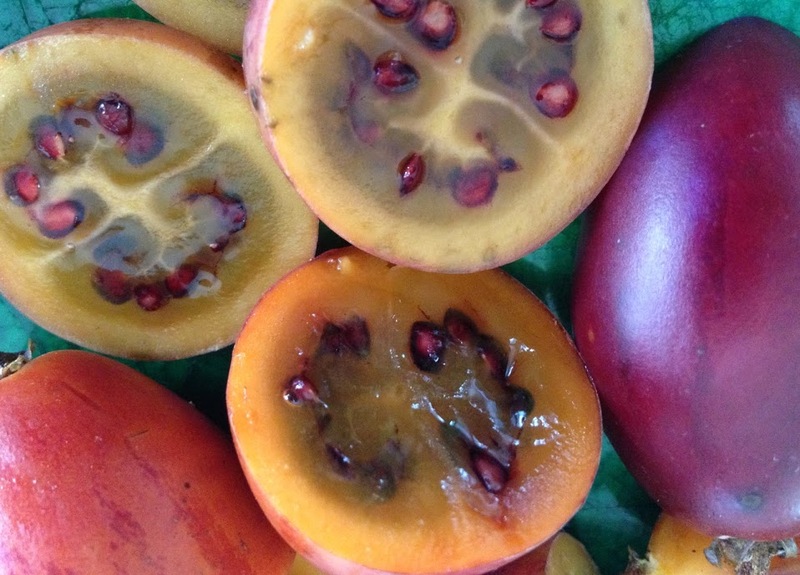 There is even a New Zealand Tamarillo Growers Association and judging by the success we’ve had in our relatively haphazard suburban Johannesburg garden I think it might be a good idea to start a South African Tamarillo Growers Association. I love the fruits peeled and sliced into a green salad with feta and a lemony honey and mustard dressing. They are good as a garnish on a Moroccan flavoured couscous and chickpea salad. 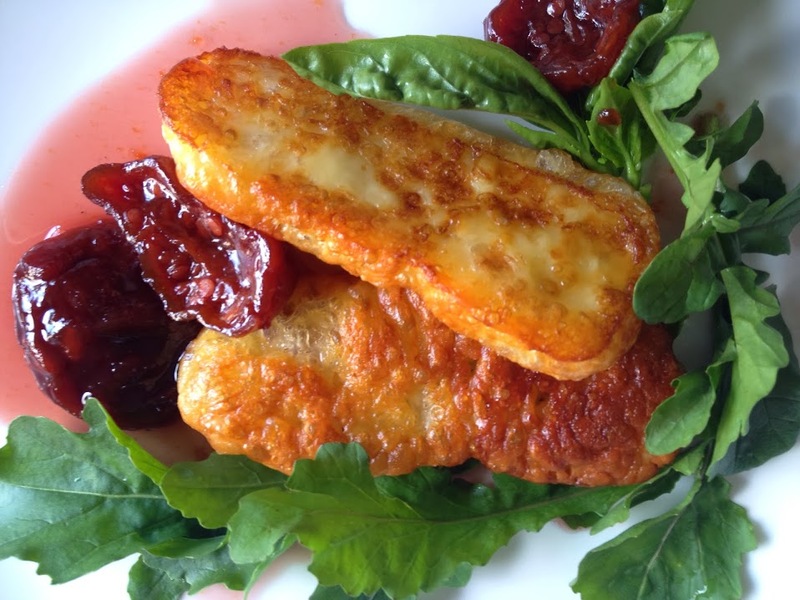 But best of all I think is how, preserved or slow roasted, they work with all types of cheese from fried haloumi to soft creamy chevin, from brie to blue cheese and from sharp cheddar to gruyere. All the tree tomato recipes from the Babel cookbook by Maranda Engelbrecht – Chevin Tart with Thyme, Tamarillo and Mulberry, Smoked Trout Terrine with Tamarillo and Fresh Fig and Tamarillo and Ricotta Bake with Cinnamon, Mint and Honey. Pour boiling water over the tree tomatoes. Leave for a couple of minutes and then peel.. Keep the oval fruits whole. Weigh them and stir in 750 grams of sugar to every kg of fruit. Leave overnight so that the sugar dissolves and ruby red juices collect. The next morning add a handful of fresh bay leaves, a stick or two of cinnamon, 12 or so black pepper corns and 4 or 5 whole star anise per kg of fruit. Bring slowly to the boil and then lower the heat and cook very gently until the fruit is beautifully red, translucent and the juices thickened. Bottle in sterilised jars and enjoy with almost any cheese you can imagine or with cold meats. Peel the tree tomatoes as above and again keep them whole. Place in a small roasting dish with the same spices as used in the preserved tree tomato recipe – a handful of fresh bay leaves, a stick or two of cinnamon, 12 or so black pepper corns and 4 or 5 whole star anise. Add a very generous splash or two of either red or white wine – whatever you have open – and sprinkle with brown sugar. Roast in the oven until the tree tomatoes are very tender and the wine has turned syrupy. Serve warm with slow roast lamb shoulder and any greens or at room temperature with cheese and rocket on crusty brown bread.